Last night I spent the evening talking about small things…the little touches that make a product feel different, human, awesome. I was at the UX Bookclub SF with Dan Saffer [@odannyboy] discussing his latest book Microinteractions (O’Reilly). The concept that resonated most with me was the idea of designing signature moments. Not a new concept, but one that jives very well with microinteractions and broader UX topics. He also handed out a cheatsheet of the book, suitable for posting in your workspace. I was there to listen, learn & sketchnote. 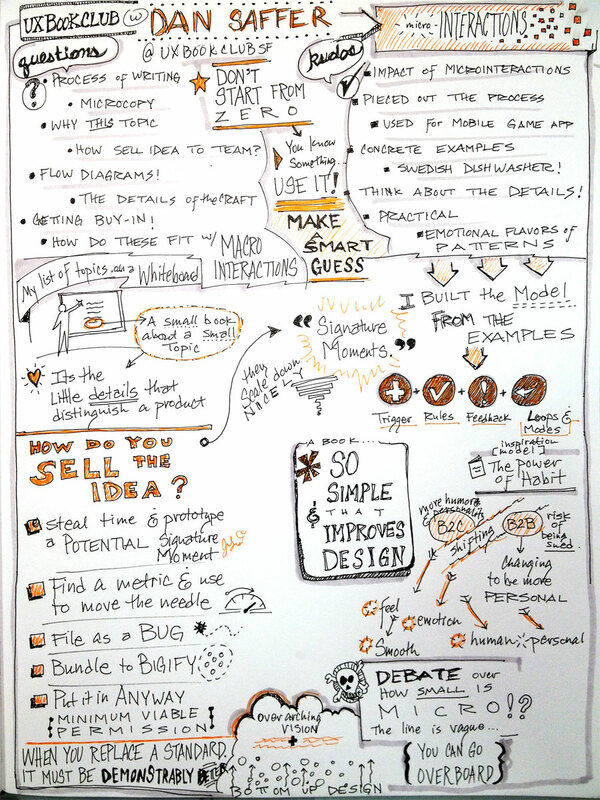 Sketchnotes for UX Bookclub SF discussion of Microinteractions by Dan Saffer. You can hear about upcoming UX Bookclub SF events by following them on Twitter (@uxbookclubsf), joining the Facebook group, or keeping tabs on the Eventbrite page.